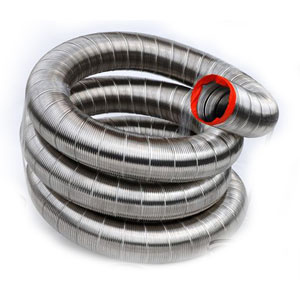 The most flexible chimney liner on the market. More ribs between each seam which means more than double the flexibility than our competitor's brand. Seven ply quad knurled locked seams. 100% leakproof, air and water tight unbreakable lock. 316L .006 Stainless Steel material, all purpose for used for venting either Oil, Gas, Wood and Pellet heating systems. Tested and approved to UL1777 zero clearance standards. Backed by a Lifetime Warranty. You can't buy a better chimney liner for the money anywhere!